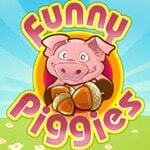 Amusing pigs in game Funny Piggies very much like to eat acorns. You need to help for them to reach all acorns for taken away time. Be careful of traps, and barriers which it is necessary to avoid in any ways.